Holy smoke! I have an addiction to mezcal cocktails. Mezcal has been popping up at the liquor store and cocktails are being shaken up at the hottest bars around the country. The smoky flavor of artisanal mezcal is created with a handcrafted process that has been used for hundreds of years. The pinas of the agave plant are cooked on a wood base fire in an underground earth pit lined with volcanic rock, and finally covered by earth for multiple days. I haven’t been lucky enough to see mezcal in production, but I plan to head to Mexico to experience this tradition, hopefully sooner than later. 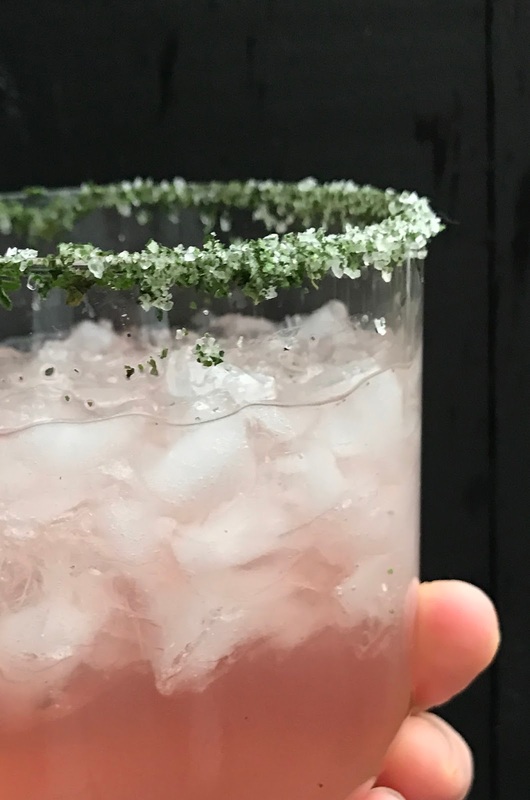 Speaking of traditions, the holidays are approaching, and a mezcal-based cocktail is a funky way to add a warm twist to any festive holiday gathering. I promise it to be a welcome game-changer. 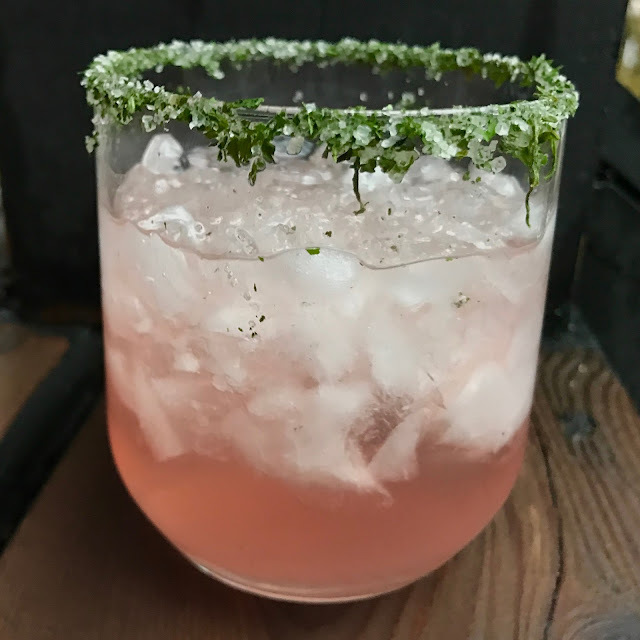 The inspiration for my cocktail comes from a local mezcaleria, Mezcaleria Las Flores, located in a cute North Side Chicago neighborhood. The drink, called the Must Collect, is a silky mix of Balam Raicilla Mezcal, watermelon, Green Chartreuse, fresh lime, honey and cilantro salt. My taste buds were blown away by the accompaniment of the watermelon, honey and cilantro salt. The watermelon was such an excellent way to tie all the flavors together. I can't wait to serve these up in a few weeks! Cheers! And Happy Holidays everyone. In a pitcher, combine the all the ingredients expect the cilantro salt. Stir well. Serve immediately. Line the baking sheet with a silicone mat or parchment paper. Spread the cilantro leaves out on it in a single layer. Place baking sheet in the oven and let the cilantro dehydrate for about 30 minutes or until the leaves are dry. Let cool. Using a spice grinder (I used a clean coffee grinder) or mortar and pestles, pulverize the dried cilantro and then stir into coarse salt. Spread the cilantro salt evenly on a plate. Squeeze fresh lime juice in shallow bowl of lime juice then dip the rim of your glass or cut a lime and moisten the rim with it. Next, you dip the rim into the plate of cilantro. I recommend serving La Costa in an ceramic mug. I purchased mine for $1.99 at Cremeria La Ordeña. This post was sponsored by Megan Media and Tropicana and all opinions are my own! Jointly, the duties included with washing a home; the practice of washing a home. Sometimes the problems involve misunderstandings, lack of clarification of what is to be cleaned and thoroughness of the job. I was told by one cleaning organization if I desired them to do windows, they'd just hire this same windowpane شركة تنظيف منازل بالرياض cleaning organization and charge me a surcharge. I believe 25-35 dollars is normally not really poor depending on the quality of work and all that they do. While I can't afford $400.00 per month, I would recommend her becuase she murdered it and my house looked better than it did when I bought it 9 years ago. They are even more motivated to obtain the function performed and perform a great work because it may indicate that they obtain to move house previously or consider on another work. At first, I thought the cleaning service was تنظيف فلل great, and arranged an every-other-week service which I continued for about 3-4 months. If you're planning on leaving your full time position to begin a washing business, be sure you possess at least six weeks of cost savings. I are a house cleaner and have been for many years. If your prices are as well low, customers will believe that your function is normally sub-standard and that you're not really experienced. Additionally, خطوات تشغيل فلتر المسبح the email confirmation I got did not itemize the support items I booked or the total quoted price we agreed over the phone. Experienced cleaners do not necessarily imply good cleaners! You will not really spend for all cleaning appointments at once. Our ordinary is certainly $100 for each various other week and if people believe that is certainly to high perform your very تنظيف خزانات بالرياض own home compleate, in 2-3 hours and after that determine what YOU would charge to perform it. Hi, I are a brand-new house owner and are considering about employing a home cleaner. Our cleaning formulas are made in-house using natural ingredients such as vinegar and cooking soda pop. I appreciate what I perform, and I'm also actually great at it. That's why people hire me. Its about selecting that perfect match. The work of washing شركة تنظيف شرق الرياض a house , room, etc., and its furnishings, especially the work of washing completely and totally. At a level price of ~$85, I sensed sculpted off when she would leave in less than 2 hours and not possess carried out some of the items on the list.